This photograph shows a street scene in Fargo Springs, Kansas, with the G. S. Smith Drug Store visible on the left side of the picture. Other businesses visible in the photograph include the Joseph M. Hawkins Land Office and J. L. Wells Real-Estate Office. Other unidentified buildings are visible. 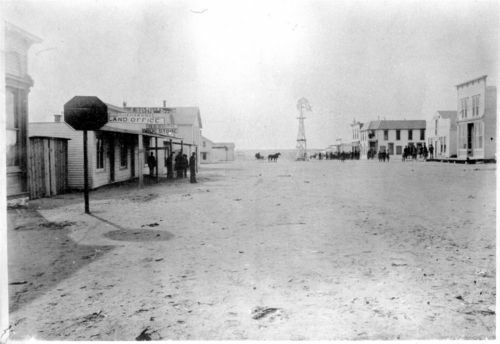 Several people are visible standing outside of buildings, and visible in the background are a horse-drawn carriage and a windmill. Holding Institution: Mr. And Mrs. Lee Larrabee, 1955.